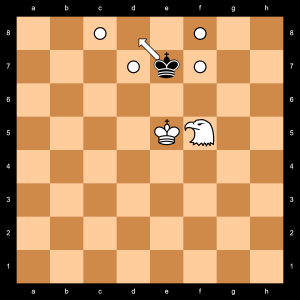 This is an example of how to mate using a Hawk in endgames with King + Hawk vs king. Not an easy task, but with the right Hawk “dance” you will prevail. First, you have to reduce the space for the opponent King. For example you can proceed like this. When the opponent king is confined in the 7th line, the Hawk “dance” begins. 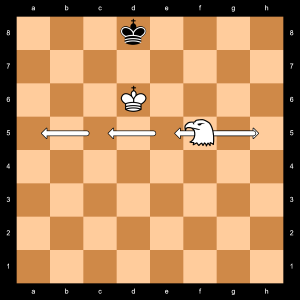 A precise maneuvering will bring the Black’s King in the 8th line the Hawk will checkmate. This is a typical position and maneuvering to limit the opponent’s King mobility and push it to the 8th line. 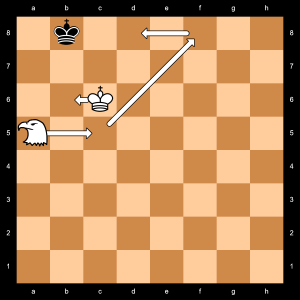 The Hawk cuts the path for the Black’s King, obliged to retreat to the 8th line. The Hawk dance begins to push the Black’s King to the corner ! 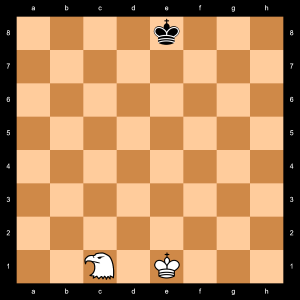 In these endings, you must be very careful and play precise moves with your King and Hawk to push the Black’s King in the 8th’s line to mate. The maneuvering is long and could rapidly reach the 50th move regulation in case you are distracted.